Today, finally, following two busy Saturdays spent in London, what seems like endless weeks of work and almost a week of illness (mine. I am still praying that Piglet doesn’t receive the gift of my pestilence) I finally spent some time with Piglet. So, what did we do with this precious time? Well, we sat at home quite a bit, annoying Granny who had been looking forward to her first child-free day in eons, though this naturally didn’t stop her from giving a constant running commentary on my complete inability to parent, particularly in her favoured areas of Discipline (there is none) and Eating (if he doesn’t do it, it’s your fault, but I will stand over him and make sure he doesn’t make a mess on the carpet anyway). 3.) the library was open. Number 1, the Grand Unveiling of the Tea Cosy, was, as you may guess from the name, the most interesting, even if, as you can see from these photos, it was more of a blanket than a tea cosy. This used to be a bus stop. Yes really. May I just say here, that the area where my mother, and now unfortunately also I, live, used to be rubbish. It used to be so rubbish that people in Bristol had never even heard of it, even though it had been part of the city for, like, eighty years, because nothing ever happened there and there was nothing to do. There wasn’t even a cashpoint. All that there was was the edifice pictured above underneath the tea cosy/blanket, which at that time was a bus stop and some public toilets. Yes, the social hub of the neighbourhood revolved around the location of public conveniences. This was the actual geographical centre of all social activity. Where other areas had a high street, we had a bus stop. A means of escape. And some loos, in case you got caught short amidst all the escaping. Now, however, that bus stop has been transformed into a cafe. A cafe which has great tea cosies. And to celebrate this fact, everyone turned up this morning at the cafe to watch a great big tea cosy being put on top of the cafe-which-used-to-be-a-bus-stop. This is now my actual life. 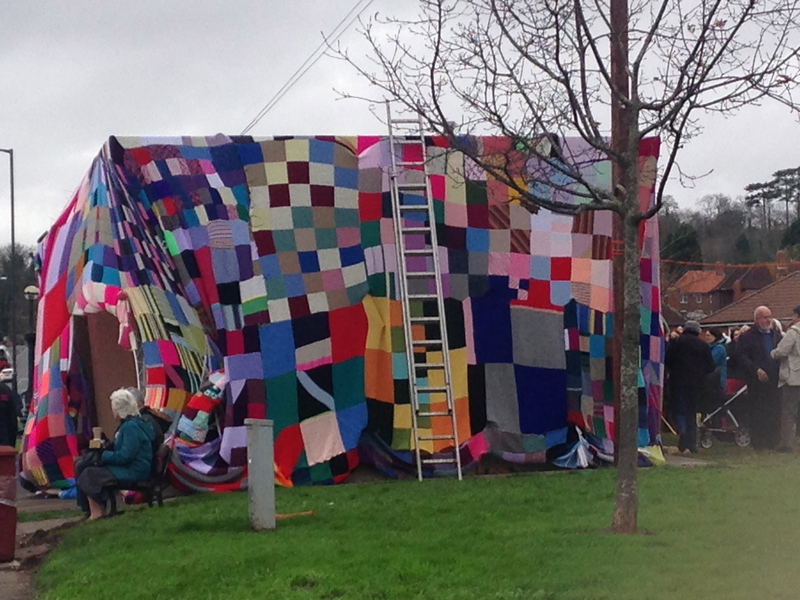 Yes, the most anticipated event in this month’s social calendar, this month’s December social calendar, at that, was the unveiling of a giant tea cosy on what used to be a bus stop, at the top of my road. And to think I used to leaf through glossy magazines wistfully at the beginning of December, checking out all the latest looks for the “party season” (which, every year since 1995, which is as far back as I can remember being interested in the Party Season, have involved some form of glitter, sequins or shiny material. Because it’s the party season, right?) and think about all the invites to all these Christmas parties that the rest of the world was supposedly invited to every night of the week each December, that were inevitably about to start plopping into my inbox left, right and centre. OK, so I’m not suggesting that I ever had quite the number of social engagements that other readers of Grazia, Cosmopolitan and the like presumably did, and to my eternal disappointment, I have still never been to an office Christmas party that was actually held IN THE OFFICE and involved scandalous behaviour on or near a photocopier (please tell me this is a thing, people. I need to know that someone, somewhere, is going to an office party tonight which is IN THEIR ACTUAL OFFICE), but I did used to have some semblance of a social life. This means that I used to have things to do at weekends which did not take place at the top of my road on a bus stop, not even one which is now a cafe. Anyway, Piglet and I made the most of our trip to the bus stop cafe and I had a lovely cup of soup and a roll. Piglet wasn’t interested in either. He was, however, very interested in this. Yes, it’s his favourite one of the three annoying emergency services vehicles that my mother got him last Christmas (actual toy not pictured. This one would have been a bit big to fit under the tree), the one which periodically yells “MY LADDER IS FOR SAVING PEOPLE!” when you least expect it, like when you’ve just popped downstairs in the middle of the night for a glass of water and accidentally stand on it. After looking at the fire engine for a bit and actually climbing in it (it was there for display, it wasn’t actually fighting a real fire at the time. We didn’t just randomly hijack a fire engine and climb in it. That would have been morally dubious. 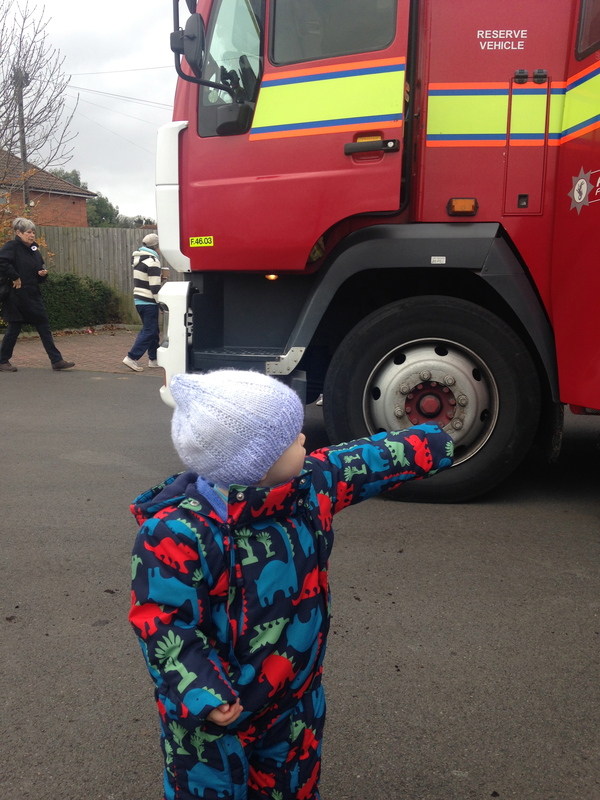 And brave, even for Piglet) we went back over to the cafe so that Mummy could get a soup, and the fire engine decided that would be a good time to start flashing its blue lights, so that the children could see the fun blue lights (and they do like these things. I once saw a fire engine give a display at a nursery, and there was so much toddler jumping up and down with excitement, I thought there was going to be an earthquake) at which point, Piglet turned in the direction of the fire engine, pointed and yelled “A-DA!” repeatedly at the top of his little lungs whilst trying desperately to break away from Mummy’s grasp and run headlong into the oncoming traffic to get back to said fire engine and get a closer look at those lovely, tantalising blue lights. A tug of war then ensued as I tried to balance my cup of soup (plus roll, don’t forget the roll), the pushchair and a wriggling Piglet making a desperate bid for freedom. A freedom in which he would be able to inspect the fire engine and its blue lights at close quarters. Finally, I managed to get him into the pushchair and take him back to the fire engine in a manner more befitting my dignity as a parent with the capability to drink soup whilst pushing a pushchair and wear a fur coat at the same time too, just as the fire engine was pulling away. Piglet then sat stony-faced, completely uninterested, as all the fire officers on board waved at him. He then decided he was going to get excited about a passing bus instead. At least spending what remains of my social life on a bus stop is paying off. Previous Post Is it Christmas yet? I’ve got high hopes for the work Christmas party. It’s not in the office (although I don’t work in an office anyway), but I am definitely up for wearing something sparkly. I know-television has given us all unrealistic expectations of office Christmas parties, that’s all I can say! Well, the firemen weren’t much to look at to be honest! I know what you mean about trying to get a toddler into a buggy though. Piglet always fights it and I feel like a terrible mother! Oh now, this is a phenomenon I hear about from friend’s children who are slightly older than Baby H. My friend’s so shouts bus bus bus, and lorry lorry lorry, so I kind of dread entering this phase and also cannot wait because it’s such a huge thing for little ones to learn and be excited about! It shows how far they’ve come in such little time. Anyway, I’m glad you enjoyed your opening of the bus-stop-turned-cafe! It sounds a bit crazy, but like a great idea!